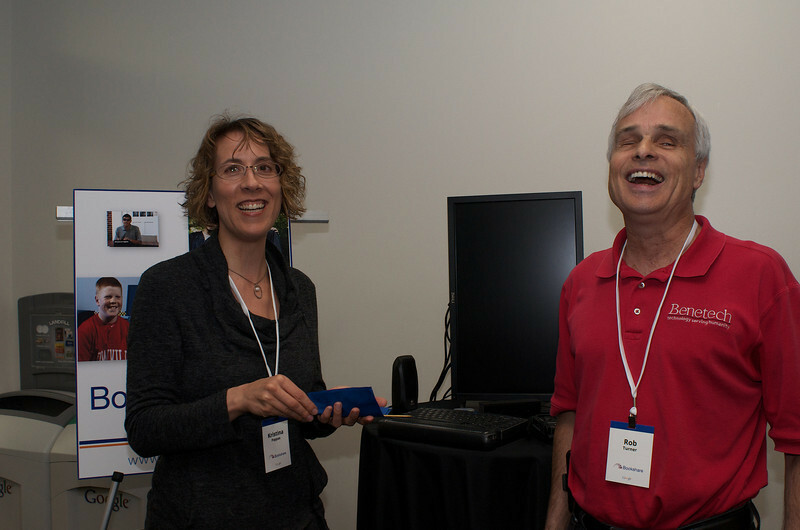 Bookshare, Benetech’s pioneering digital library for people with print disabilities, celebrated its 10th birthday last night with a terrific party that was attended by many of our long-time friends and supporters. The event was hosted by Google on its campus in Mountain View, California, which is home to some of the most cutting edge technologists in the world. During the event, our Bookshare staff offered demos of our Bookshare library and our Go Read accessible ebook reader for Android. They also demoed Read2Go, the accessible ebook application for the Apple OS and Route 66 Literacy, Benetech’s online literacy instructional program. During the party we had a surprise video message from Stevie Wonder, a long-time Bookshare member who told us that he is using Read2Go to read accessible books from the Bookshare library. “I can feel it all over, it’s a hit!” said Stevie. Thanks Stevie! We think so too. T.V. 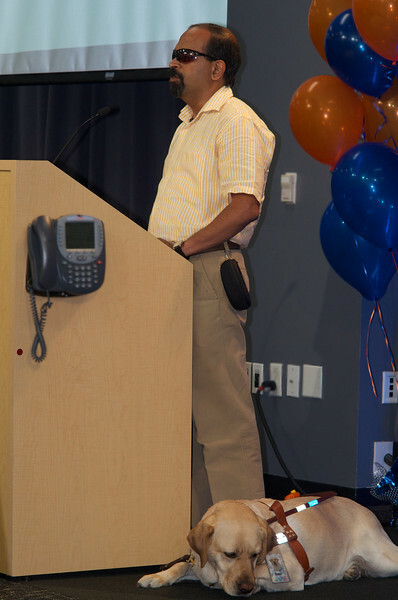 Raman of Google Research, a long-time Bookshare member and advisor, was on hand to help us celebrate last night. T.V. noted that Bookshare pioneered the delivery of low cost, accessible books for people with disabilities, and he looked forward to Bookshare’s 20th anniversary party when we would be demoing the next generation of this technology. 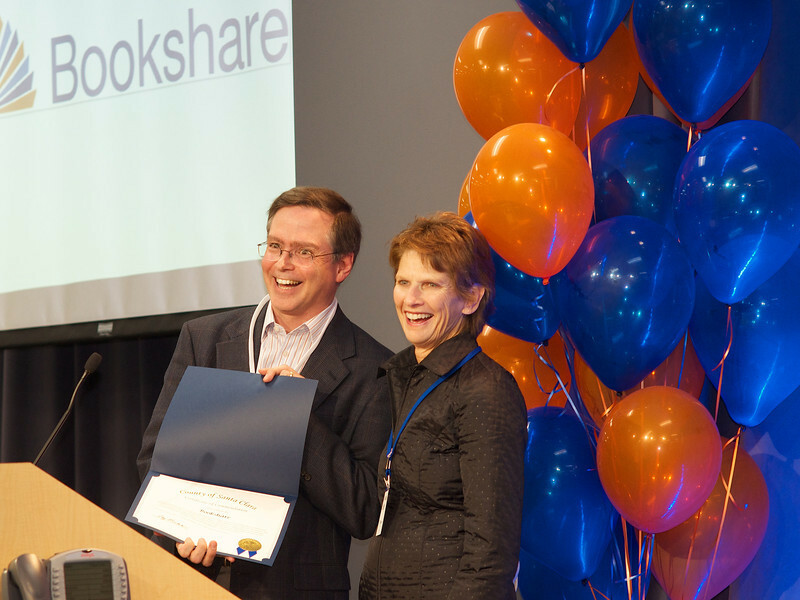 Bookshare was one of the early recipients of a Google Grant of online advertising, which continues to this day. This summer, we will have three students working on Bookshare software for our users underwritten by Google’s Summer of Code program. Bookshare has always attracted people who want to revolutionize how printed material is made available to people with disabilities who cannot read traditional books. Our vision is to provide equal opportunities for students with disabilities and help them overcome a major barrier to accessing to the most valuable prize in society: a great education. Visionary funders who have supported this radical idea from the start attended our party last night including members of our board. Board members Gerry Davis, Jim Kleckner, Leighton Read, Brian Behlendorf, Christy Chin and Rob Wexler have provided wise counsel that has steered Bookshare’s success. During our party, we also honored Social Profit Network's Robert Levenson, the Skoll Foundation and the Omidyar Foundation which provided vital philanthropic funding to expand Bookshare over the last decade. In addition, we acknowledged the critical support of Bernie Newcomb who helped fund our International Bookshare service. Bernie was represented last night by Marie Young of the Silicon Valley Community Foundation. During the party, we were delighted to receive a commendation from Marcia Adler who attended the party on behalf of Liz Kniss, who represents District 5 on the Santa Clara County Board of Supervisors. Liz has been a long-time Bookshare supporter, and we were honored by the acknowledgement. The idea for Bookshare came to me when my then-teenaged-son Jimmy, who also attended last night’s party, brought home Napster. Jimmy had discovered Napster at the home of my neighbor, Eileen Richardson, who was then the acting CEO of Napster. Napster made me think of how peer-to-peer information sharing could help people with disabilities. I figured that if one Bookshare user thought a book was worth scanning, then that book was worth sharing with people around the US who also had print disabilities. When Bookshare was first created, most people with print disabilities read printed material via books on tape delivered through the mail, which was expensive and slow. Our breakthrough with Bookshare was to put our users in charge of the collection. Instead of us deciding what people with disabilities should read, we let our readers decide which books should be scanned and shared under an exception in the U.S. copyright law. Our lower cost model made it practical to invert the power structure. As a result, we quickly became the largest online library for people with print disabilities. 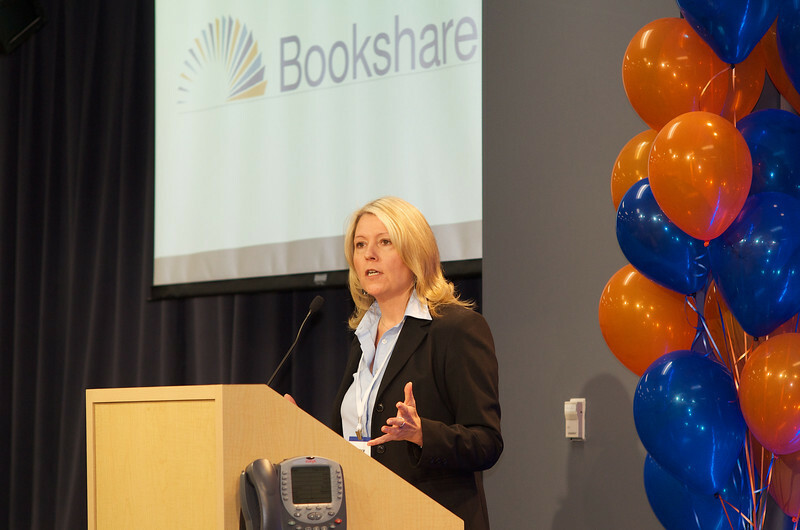 Bookshare has grown tremendously from the 3,000 students that we were serving in 2007. A little over 4 years ago, we won a competitive contract award from the US Department of Education which took a bold risk on Bookshare. With this support, we began reaching out to students, teachers and schools throughout the U.S., and that risk paid off. By this September, we will be serving over 200,000 students with print disabilities in the US, twice the number that we promised the Department of Education we would reach by this date. By September, we’ll also have added more than 100k educational titles and achieved more than 3 million total downloads, delivering books for less than one tenth of the cost of traditional approaches. Each month, we add more than 2,000 new books to the Bookshare collection and more than three quarters of those books come from socially responsible publishers who want to make their work available to all readers. The first publisher to donate books to Bookshare, years ahead of their peers, was O’Reilly Media. Bookshare also works with large trade publishers such as HarperCollins, Random House, Scholastic, international publishers like the IMF, World Bank and Brookings, twenty-two university presses, and more than one hundred and fifty other publishers. These publishers eliminate the laborious steps of scanning and proofreading digital text by giving us permission to share the text with readers with disabilities. They send Bookshare the same digital book files that they provide to Amazon, Apple or Barnes and Noble. It was great to be able to celebrate the Bookshare team, and the users who created this tremendous library, with the help of Google, our many friends in the area, and Stevie Wonder!